It's often thought that male elephants are unattached nomads, but one ecologist is out to debunk that macho myth. 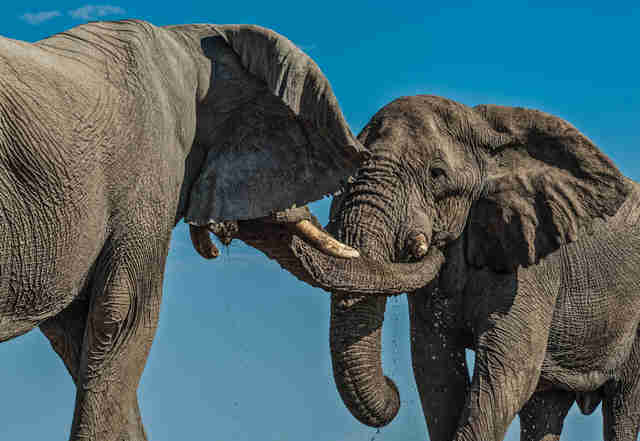 "Male elephants are actually very social animals," Caitlin O'Connell - whose book, "Elephant Don: The Politics of a Pachyderm Posse," is out in April - told The Dodo. "Many males form close bonds within an extended social network and have ritualized bonding behaviors" akin to human males. 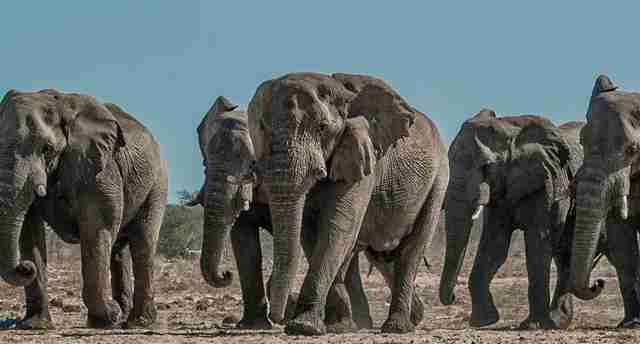 O'Connell spent two decades studying a group of male elephants - she calls them "the boys' club" - at the Etosha National Park in Namibia. As teenagers, she notes, male elephants are kicked out of the matriarchal herd to fly solo. But, as she discovered, these reputed lone wolves aren't actually loners. And when it comes to interacting at the local water hole, there's an "extremely organized" social order, like "lining up to kiss the ring of a pope or a Mafioso don," O'Connell explained to the Smithsonian. 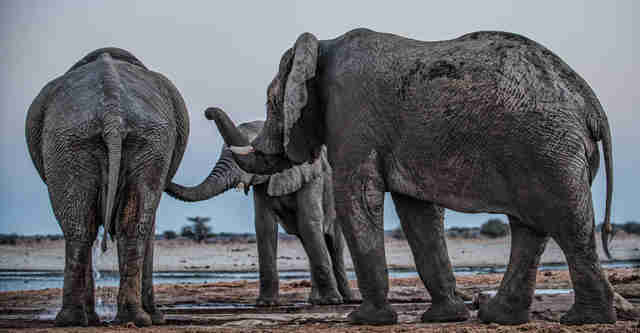 When a dominant elephant rolls up to the watering hole, the younger bulls take turns placing their trunks in his mouth. When it comes to Greg (center), the popular leader of "the boys' club," the young bucks go wild. But sometimes the boys are too excited to wait their turn, resulting in a "two-trunk salute," O'Connell told The Dodo. 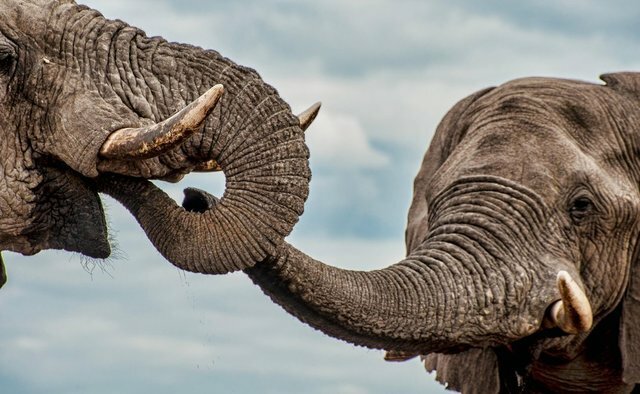 "Youngsters will repeatedly place their trunk in his mouth while he is trying to drink. Most of the time, he will put up with it," she said. Even when mobbed by boys trumpeting their adoration, large-and-in-charge Greg is a gentle giant. Sadly, O'Connell has observed that less aggressive bulls "tend not to break their tusks," which can be disastrous in the long run. They often grow larger tusks that are highly desirable to poachers, and are therefore less likely to survive.